(Caran d’Ache Private Collection). Rhodium-coated Sterling Silver. Limited edition “Gotica” from Caran d’Ache’s “Private Collection”. It is a miniaturized tribute to gothic art and architecture. “Gotica” has a six-sided rhodium-coated sterling silver body and cap and each surface displays a gothic window of rosette and fleurs-de-lis in luminous colours. The edition is limited to 1140 pieces as a tribute to the age which provided its inspiration. Each of these luxury fountain pens starts its life in the workshops of Barcelona silversmiths Miguel Cunhill who produce the silver framework for the gothic decoration. Caran d’Ache master craftsmen then apply the colours to the pen using a fine brush. The colouring technique is appropriately reminiscent of that used to create stained glass. Presented in a handsome wooden case, the Gotica is destined to become a reference for collectors. (Caran d’Ache Private Collection). Gold finished, with Chinese Lacquer. Limited edition “Harmony” fountain pen: the art of Feng Shui applied to handwriting. For thousands of years, Chinese culture has been based on the teachings of Feng Shui, which aim to improve the quality of life for each individual. Today, the secrets of this traditional wisdom in the areas of health, wealth and happiness have been revealed and have conquered the rest of the world. It was inevitable that these universal values would capture the attention of Caran d’Ache which has worked with a Feng Shui expert to create the Harmony limited edition. 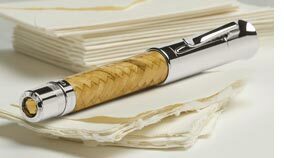 The pen was conceived and developed in accordance with the principles of Feng Shui, helping its owner to make the most of every day of his or her life. 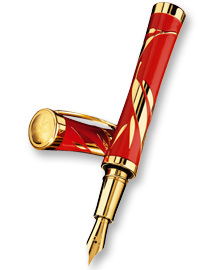 It is produced in 888 examples (001 / 888) – a number that favours good luck and prosperity – and the pen is finished in gold, together with genuine red Chinese lacquer. (Caran d’Ache Private Collection). Vermeil (gold-plated silver). Limited Edition “1001 Nuits” is inspired by the Orient. The new fountain pen in the Private Collection from Caran d’Ache reflects passion. The blend of gold and deep blue recalls the star-studded skies of our childhood dreams, while interlaced Arabic calligraphy brings to mind the ardour of the two lovers’ passion. Limited to 1001 pieces and intended for art aficionados and collectors, it is a truly exclusive work of art. Its body is crafted in vermeil (gold-plated silver) and adorned with the work of acclaimed Swiss goldsmith and jeweller Edouard Jud. 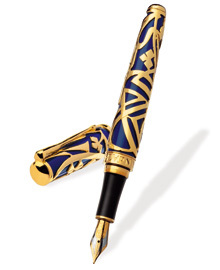 The designs ornamenting the fountain pen are freely inspired by Arabic calligraphy. Graf von Faber-Castell Limited Edition Perfect Pencil in 18 carat white gold and including 3 fine quality diamonds in the crown of the cap. Supplied with a certificate for the diamonds and its limited edition, there being only 99 pieces in the world. With Fossilised/petrified wood and Platinum-plating. 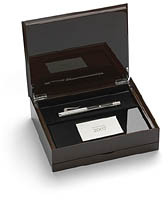 “Pen of the Year 2007” – an outstanding limited edition fountain pen from the Graf von Faber-Castell Collection. 2007’s release takes us millions of years into the past with a barrel made of petrified wood. Cut and crafted by expert gem cutters, the fossilised wood is painstakingly crafted to give the barrel jewel-like qualities. 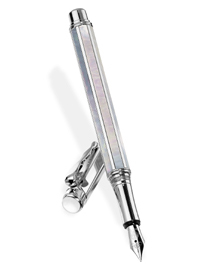 Please click here for full details of Graf von Faber-Castell’s Pen of the Year 2007. “Pen of the Year 2008” – this year’s outstanding limited edition fountain pen from the Graf von Faber-Castell Collection . This fine release features the world’s smallest parquet of finest Indian satinwood. The inspiration was Countess Ottilie’s private salon (or drawing room), found in the Faber-Castell castle, which itself features 100 year old panelling in luxurious East Indies satinwood. (This expensive wood is also known as lemonwood due to its fragrant scent and thus the Countess’s salon has come to be known as the ‘Lemon Room’). The pen’s herringbone pattern was also inspired by the Countess’s own writing desk which, along with other items of her furniture, features such a pattern. 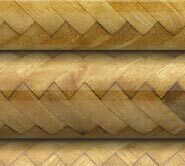 There are at least 84 satin wood rectangles which have been individually hand crafted for the filigree herringbone pattern on this amazingly detailed writing instrument. No two panels are the same and each individually numbered instrument is therefore unique. The barrel has been repeatedly polished and varnished in a very time-consuming process, and the numbered implement is crowned by a chessboard-faceted citrine gemstone set in the end cap, platinum-plated metal fittings and an 18-carat bicolour gold nib, which has been carefully manufactured in an elaborate process including many stages performed by hand. Finally the nib, which is available in Fine, Medium and Broad writing widths, has been run in by hand for excellent writing properties and performance. Each pen is individually numbered (inside, on the plunger filling mechanism concealed underneath the platinised cap). The metal clip is of solid metal, is hinged and spring-loaded. As the owner of a Pen of the Year you can register your pen and take advantage of an exclusive service: once a year you can have it cleaned and checked by experts, at no charge*. This writing instrument oozes quality and is truly a work of art. • Quantity produced is limited to one year’s production only. • medium (M), fine (F) and broad (B) nib widths. • Spring-loaded solid metal clip to ensure that the pen sits firmly in the pocket. • Platinum-plated metal fittings and citrine gemstone incorporated into the design. • with a beautifully designed brochure plus certificate. 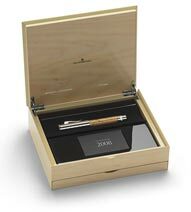 • Limited Edition Certificate bears the personal signature of Count Faber-Castell. • Complimentary service and clean by experts, at no charge*. * Correct at time of writing (early April 2008). Service, operated by Faber-Castell, requires registration. Possibly the most exclusive, valuable writing instrument in the world. 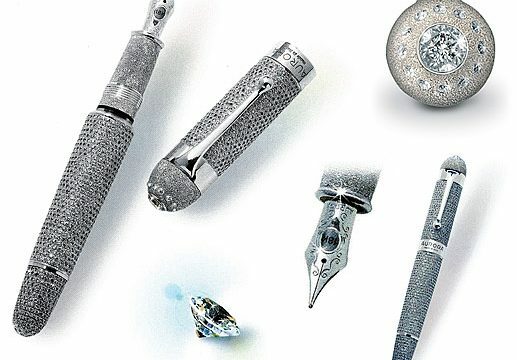 The only pen in the world known to contain over 30 carats of diamonds, this masterpiece is created by Aurora, the oldest and most prestigious fountain pen manufacturer in Italy. 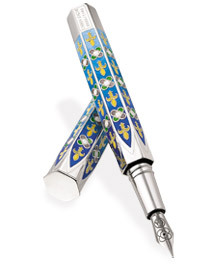 An exquisite diamond cabochon crowns nearly two thousand “4 C” certified De Beers diamonds on a two hectogram solid platinum barrel with a two-tone, rhodium-treated, 18KT solid gold nib, creating what may well be the most exclusive, valuable writing instrument available in the world. Although the price for this piece is not published to the public, it is believed to be circa €1 Million Euros. Only one of most fortunate of people in the world may contend, each year, ownership of this most exclusive jewel of jewels, personalised with their coat-of-arms, signature or portrait. A similar series, limited to only ten pieces and accomplished in white gold, may also be contended for by the world’s elite. The two different versions are said to represent the brightness of dawn and the charm of nightfall – a celebration of the first and last rays of the day. Inimitable jewels, hand-delivered in any part of the globe. 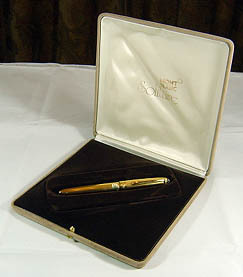 Aurora is a leading Italian company in the production and sale of quality writing instruments. Founded in Turin in 1919, Aurora has become part of the history of writing instruments, thanks to its ability to combine leading-edge design and the best Italian craftsmanship. A rich cultural legacy and a long tradition of success have made Aurora’s writing instruments true masterpieces of Italian craftwork, recognised and esteemed the world over. Please contact Pens From Heaven for further details and availability. 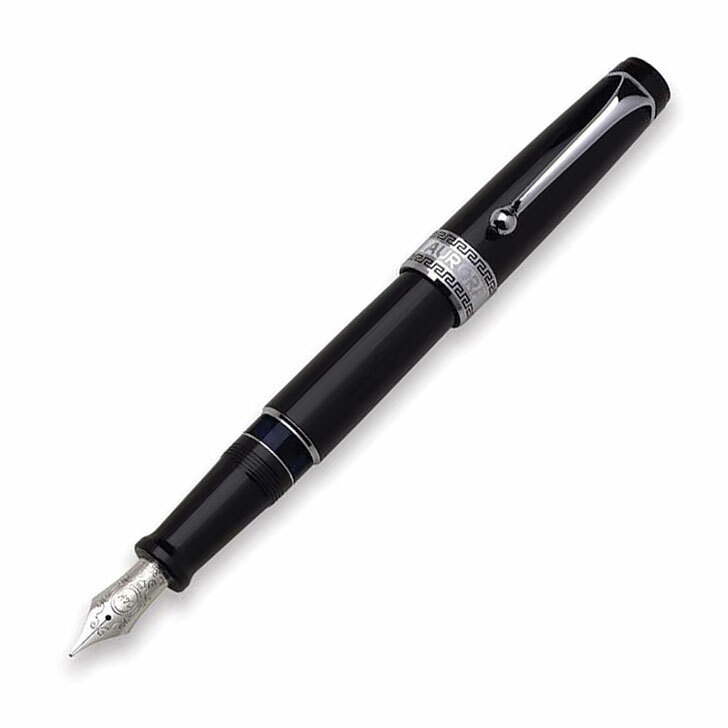 The Optima fountain pen from Aurora, shown here in black resin with chrome-plated trims, represents timeless elegance, attention to detail and fine craftsmanship. 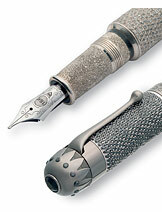 It features precious materials including a rhodium-treated nib in 14Kt. solid gold. The main ring shown just off-centre above is embellished by classical Greek-inspired decoration. The gift box which comes with the Optima is shown on the right. Nib widths available: Extra Fine (XF), Fine (F), Medium (M) or Broad (B). This is the “Lagoon” limited edition fountain pen from the Caran d’Ache Private Collection, featuring rhodium-coated Sterling Silver. It is adorned by panels of genuine mother-of-pearl which shimmer in all colours of the rainbow. They come from Indonesian pearl oysters, and are hand applied into the six panels on the pen body by Caran d’Ache craftsmen. The clip, made of rhodium-coated sterling silver, is styled in the form of a wave. This Limited Edition pen is accompanied by a numbered certificate. Product code: 1601.481 (sorry — no longer available).